MyMemories Blog: Meet this week's *Featured Designer*!! It's "Magical Scraps Galore"!! Meet this week's *Featured Designer*!! It's "Magical Scraps Galore"!! Header Banner kit: Most Magical Place from Magical Scraps Galore! 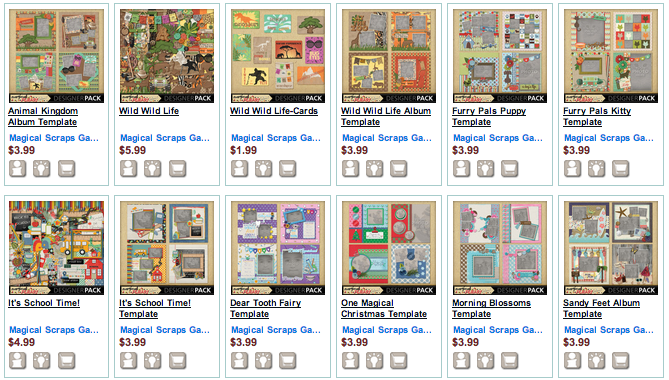 The WHOLE Magical Scraps shop is on sale this week! Hi, everyone! My name is Marina and I design as Magical Scraps Galore. I live in Argentina with my husband Peter and our two kids, Emilia and Andres -12 and 11 years old- and Calla, our fat furry cat. I have been digiscrapping for twelve years now, and designing for two. Both scrapbooking and photography are my passions. During my boring day job I work as a translator and assistant to the CEO of an American corporation, but I need to keep my creative juices flowing, that's why I love designing so much. My creations are inspired by my kids: I have been scrapping every single moment of their lives since they were born, and their scrapbooks are a keepsake to help them remember and cherish their childhood forever. Marina what YOUR favorite kit is in her shop at MyMemories.com! There are some gorgeous kits in Marina's shop. I like most the kit WILD WILD LIFE and would be really happy to win this amazing kit. Among all of the terrific kits in the shop, my favorite is the colorful Furry Pals Kitty Collection ! I have a couple of furry friends this kit would be perfect for. Wild Wild Life and Furry Pals are my favorites. Can you tell I love animals? I love the Most Magical Place kit! It reminds me of a semi vintage Disney kit. I love the bright but muted colors in it. I would have to choose Wild Wild Life. I love it! Thanks for the chance to win! Furry Pals Kitty Collection because we love our kitties! I love the colors in many of these kits! Hard to choose just one. If I must, School Time is my top pick (followed closely by Wild Wild Life and Happy as Can Be). Thanks for the opportunity to win! I love the Furry Pals Puppy Collection! My favorite is the Furry Pals Kitty collection. Marina. I just love your work. it reflects your amazing love for children. I have 3 grown children, and am very blessed to have one grandson, who is almost 5. He has truly been the joy of our lives. To see the world through a child's eyes is Priceless. My choice is Most Magical Place. This is where we hope to goes with our grandson next spring. I will already be prepared. Heartfelt thanks for the opportunity to win one of your kits. I like the 100% Boy kit. My fav is the most magical place... Love it thanks so much for the chance to win!! Wild Wild Life. Thanks for the chance. Thanks for the chance! I like her Dear Tooth Fairy kit!! Just wondering - who were the lucky ducks from last weeks Amy Dane give away? Thanks! I love the 100% girl kit! I love Most Magical Place! And the extras that go with it! Gonna add it to my want list! I love her kits! they are so adorable! my favorite is Furry Pals best! thanks for the chance! What charming kits! I just love Wild Wild Life. Great work! So many nice kits. I like Wild Wild Life as well as many other ones. TYSM! Just had fun looking through some of the kits and "Sew Crafty and Vacation Bible School" were a couple that looked adorable and would be fun to use.